Intel announced its first market ready Optane products at the end of January, its low capacity (32GB) Cache SSDs. On Sunday the corporation released its first high capacity Optane SSD drive; the DC P4800X with 375GB of storage. According to PCWorld, this $1520 drive will be joined by a version with 750GB of storage in Q2, and a 1.5TB model in H2. Intel's Optane SSD DC P4800X range is aimed at enterprises and fit in PCI-Express/NVMe and U.2 slots. 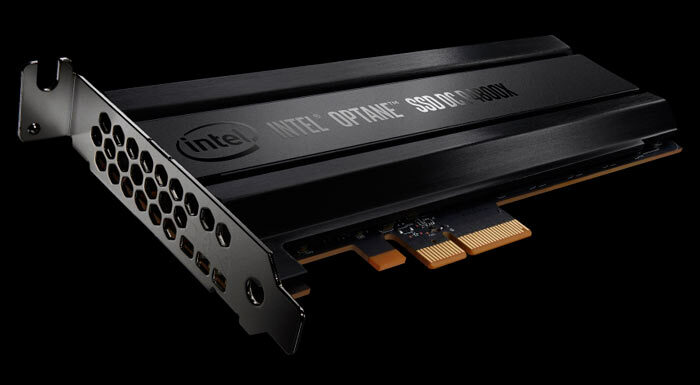 Ahead of this larger capacity Optane SSD release, Intel had been hyping the storage performance of the technology as being up to 10X faster than a conventional flash SSD. It often refers to Optane as "a storage solution that behaves like system memory". In new benchmarks published (PDF) by Intel, the performance gain isn't so large or clear cut. These tests of the shipping product show that the first Intel Optane SSD DC P4800X "delivers 5-8x faster performance at low queue depth workloads, exhibiting extremely high throughput for single accesses and super low latency". Other strengths of the Optane SSD DC P4800X series are; responsiveness under load, predictably fast service (60x better than a high-endurance NAND SSD), and ultra high endurance with extended life. The above cases show that the Optane SSD DC P4800X series offers the kind of performance that is ideal for data centres and the acceleration of enterprise applications, says Intel. The drive series should enable users to increase the size of data sets to bolster 'big data' calculations. Its affordability means that Intel Optane SSDs are likely to displace some DRAM in servers. As reported by PCWorld, the new Intel Optane SSD DC P4800X 375GB model costs $1,520 and is available now. The price tags for the larger capacity members of the series, coming later in 2017, weren't divulged. I would love one of these, but not at that price! I'm still unsure if I can even bring myself to buy an M.2 drive yet never mind this haha, I do need another SSD though as my current one is small and aging, I am probably better off just getting another standard Sata III one, as they ARE fast enough for my gaming rig at the end of the day. I could see the 32 gigabyte model being amazing for video games, particularly games with lots of loading screens. I imagine the difference between a HDD and SDD would be the difference between a SDD and one of these. Imagine playing Fallout 4 or Skyrim with 1/8th the loading time. Why would anyone want this drives.. seriously nothing for the home user. I actually have both to be honest my main drive is the plextor PX-512m8 and i am kinda satisfied with it. As data drive i made a raid0 partition from 2 x 480 Gb samsung enterprise Mz7 series ssd and those show to be often a match to the nvme drive.. Many people expect way too much from the new nvme drives, when people would be really honest and could compare like i did most would be surprised how well the sata 3 (sata600) enterprise ssd perform yes in many cases they beat the nvme drives. Only when at some points the nvme show their muscle. I actually preffer the normal mlc-ssd over the nvme ones but they are yound so they might get better in time. Sadly plextor does not provide drivers for their product so improvements will not happen as with the samsung drives. ( could be a good thing as samsung adds spyware in their firmware ). Anyway if you use the benchmarks the nvme ofcourse win, but normal usage you really should not think the nvme is faster. Because the reality can be the absolute opposite in my experience. My other system with 2 x ocz vertex 4 - 250 Gb ssd showed they often get better performance.. I compared the samsung 961 from a friend with the plextor and then compared that ssd's again to the raid0 mlc-ssd and again showed with normal usage you hardly get any gains. So a much cheaper setup with a duo of those normal ssd does do the job faster. Even though the synthetic benchmarks show otherwise. You really do not need them, except if you run heavy modded games their you can see a huge performance gain. For instance when you play skyrim modded for 4k screen play. Then i really see faster loading. But to pay kinda triple or more the price of a comparable sized normal ssd is really not worth the money. You really are better off buying 2 ssd and put them in raid0 for near 1100 MB/s read/write speeds To compare the speed of the plextor read 2500 MB/s write showed 1400 Mb/s max and the samsung 961 gave 2900 Mb/s and 2200 Mb/s write. This ofcourse in the synthetic benchmarks.